"Everyone is different, but elves are more different than others." Elves are indeed a strange folk. Their bodies work differently; what is normally edible or harmful kills or heals an elf. Some say it's because elves are slow inside - maybe they are right, elves live for over eight centuries. But then, no-one is as fast as elves. Their speed, balance, and elegance are legendary. Elves have nearly black hair, green-circled black eyes, and beastlike features - all of them; for elves all look the same, like twins. Actual twins are one person in two bodies, extremely rare, and quite feared. There are no half-elves; children of elves are elves as well, and elves are more often than others subject to racist prejudice. Elves can be voices for their entire lives. 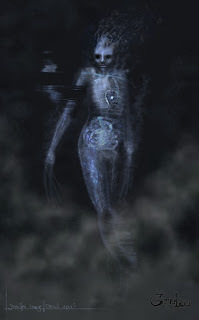 They can communicate with spirits easily, and many spirit collectors are elves. "The most frightening person I can think of? An elven twin assassin." Elves depend on an intact environment. A long unchanged town, even bustling with people, will do just as well as a beach or forest. It's fresh destruction that affects them; mining, logging, large construction sites. Many elves are engineers and architects to ensure a nature-friendly process. 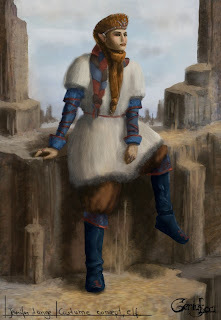 Mentally, elves are often absent, or seek solitude. They long to understand a wisdom that seems just beyond their reach, making them prone to mental disorders like obsessions or paranoia. They partake in society less and less with age, focusing on their meditations. Every good fantasy setting needs elves; I found them the most difficult race to design. I dislike the over-powered elves of common fantasy: unbelievably beautiful, overly smart, and - of course! - magical. 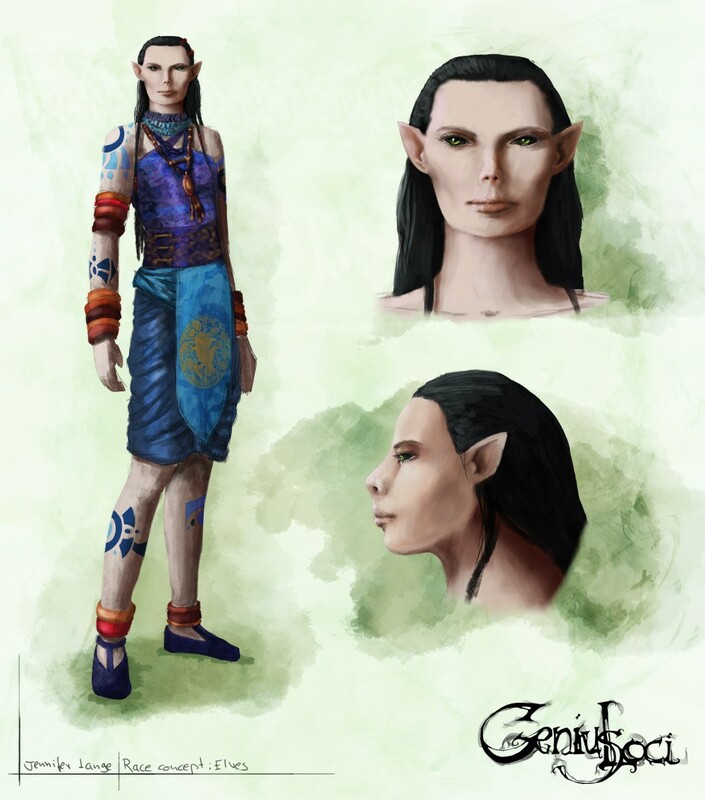 I wanted the Genius Loci elves to be a people than can be interacted wit, that can appear as normal inhabitants of the world, yet retain some of the mysterious qualities of traditional elves. I think they turned out okay, with the similarities in appearance and spirit affinity. By the way, elves are equally often mages and wizards.